Muru Jewellery > Jewellery Care > What is Gold Vermeil? Gold vermeil jewellery is becoming increasingly popular because you can get the look of solid gold without the price tag. 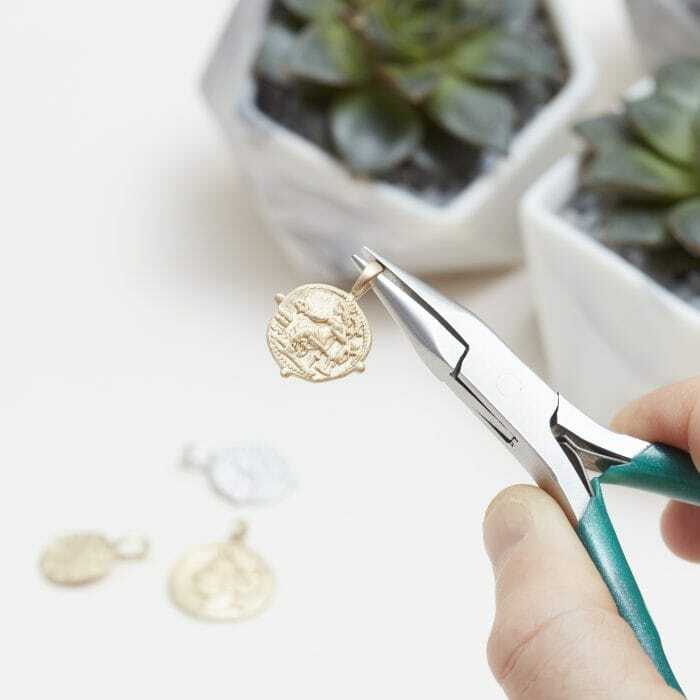 Read on to find out more about the process of creating vermeil jewellery and how best to take care of your vermeil pieces! Gold vermeil is a high quality form of gold plating in which a thick layer of gold (this must be more than 2.5 microns and is usually between 14k – 22k gold) is coated upon sterling silver. Gold vermeil is a technique of gold plating that was originally developed in France in the 18th century. During this period, the majority of large objects produced by goldsmiths featured gold vermeil and today gold vermeil is used in many of the Crown Jewels, Olympic gold medals and contemporary jewellery too. Pure 24k gold doesn’t tarnish. All of our gold vermeil jewellery features an 18k gold vermeil plating which may dull slightly over time when coming into contact with lotions and chemicals found in some cosmetics. To restore your gold vermeil to its original lustre, we recommend using a gold polishing cloth which is impregnated with gold. Alternatively, a microfibre cloth such as the one you would clean a tv screen or a pair of glasses, will help to significantly brighten the appearance of your gold vermeil jewellery. Gold vermeil allows the jeweller to create beautiful gold jewellery designs, without the expense of using solid gold. Gold vermeil jewellery is crafted only using precious metals so it is more hypoallergenic and it gives the wearer the option of wearing gold jewellery at a much lower cost than solid gold. We like to use gold vermeil for the gold plating of our gold jewellery because it is in-keeping with the craftsmanship of our pieces. Gold vermeil is the most traditional form of gold plating and has stood the test of time since it was first used by French artisans in the 1700’s. Of course now we use a more modernised technique to create gold vermeil, but it remains the preferred method for silversmiths and goldsmiths to gold plate their designer jewellery today. How do I care for my gold vermeil jewellery? Taking good care of your gold vermeil jewellery will ensure it preserves the longevity of the piece. Make sure to store it in a cool, dark place away from direct sunlight. We would also recommend that you remove your gold vermeil jewellery when bathing or applying perfume as this can cause it to have a dull sheen or in rare cases can cause the gold plating to wear off more quickly. As we mentioned earlier, gold vermeil also refers to the thickness of gold as well as the plating technique. Gold vermeil has a thickness of gold over 2.5 microns. Most costume and fashion jewellery is flash gold plated, which is usually well below 1 micron in thickness and is therefore not considered to be gold vermeil. Flash gold plated jewellery tends to be made with base metal instead of silver which can cause the jewellery to turn green or black relatively quickly, this is a very cheap way of creating gold plated jewellery. For all of our gold jewellery, we use a thickness of 3 microns of gold, plated upon sterling silver which provides a thick coating of gold that is capable of withstanding a busy lifestyle. In our gold vermeil plating we use 18k gold for its warm colour, durability and preciousness. Each piece of jewellery comes with a 12 month warranty to give you confidence when buying with us. View a selection of our gold vermeil jewellery. For more information on caring for your gold vermeil jewellery, please refer to our care guide. 18k gold vermeilgold jewellerygold necklacegold platinggold vermeilgold vermeil necklacewhat is gold vermeil?